The world (or at least the part of it featured in this campaign) is a dangerous place, filled with the ruins of fallen kingdoms and forgotten temples to dark gods. There are few places where any kind of safety can be assured. A large dwarfhold in the Azure Mts, Abad Duraliai is, arguably, the oldest dwarven city in the world, and is certainly the oldest in the region. Upwards of ten thousand dwarves are reported to live here, in a hold tunnelled far beneath the mountain. The city's workers produce fine quality steel, which is shipped as far afield as Bard's Gate, and even across the Inland Sea. Acregor was a powerful necromancer who, centuries ago, ruled over the kingdom which bore his name. The kingdom was overthrown at about the same time that the temple of Orcus in Tsar was destroyed, and the necromancer was slain. Today the land is still named Acregor, and is a place of ill omen. Cold fens and bleak moorland stretch for miles, with the only sign of civilisation being the occasional ruins and ancient burial mounds, often containing treasures from the former kingdom. Explorers report that the place is a haunt of trolls, ogres, and other less wholesome creatures. A small township which sprang up around a fortress. The fortress was constructed by an order of paladins, followers of Muir, as a place from which they could mount sorties into Acregor. Following the fall of Acregor the fortress has lost its major purpose, and is now largely deserted, with only a few worshippers of Muir still based there, and those only staying because of the town which thrived under their order's protection. A range of high peaks which mark the current northern boundary of the civilised lands, the Azure Mountains are known to be home to orcs, goblins, trolls and dragons. Established many years ago as a bard’s outpost and way station for travelers between the inner Forest Kingdoms and the port city of Reme, Bard’s Gate has grown into an important crossroads for trade and travel. The city’s banner depicts a silver lyre above a stone gatehouse on a green field. Bard’s Gate is currently an independent city, allied to the nearby Grand Duchy for mutual defense and prosperity. The Grand Duke’s troops help defend the city against the evil creatures from the Stoneheart Mountains to the north. A liberal and tolerant city, Bard’s Gate welcomes all races. A small town on the coast of the Great Sea. The town's major claim to fame is that it has been, over the last four hundred years, the birthplace of several notable heroes. Derindin is located on the Tradeway from Bard's Gate to Freegate, at a point where the road crosses a gorge. Several bridges have been constructed over the gorge, and have gradually merged together, with houses and other structures built on them. A peaceful village located off the Tradeway between Reme and Bard's Gate. Fairhills fields are bountiful, and the populace is generally happy, due in large part to the blessings of the goddess Freya. The Forest Kingdoms are somewhat misnamed. Each "kingdom" encompasses, at best, a few square miles of woodland. Occasionally there is a "capital", a handful of shacks and hovels which acts as the seat of power for that particular kingdom. The people are fiercely independent woodsmen who refuse to recognise the authority of anybody other than their own kings. Since the construction of Rappan Athuk, the name "Forest of Hope" has become more a matter of irony than a description of the place. City located where the Tradeway from the west meets the Coast Road. Freegate has become a major trading centre, despite not having its own harbour, and goods bought and sold here can eventually reach almost anywhere. 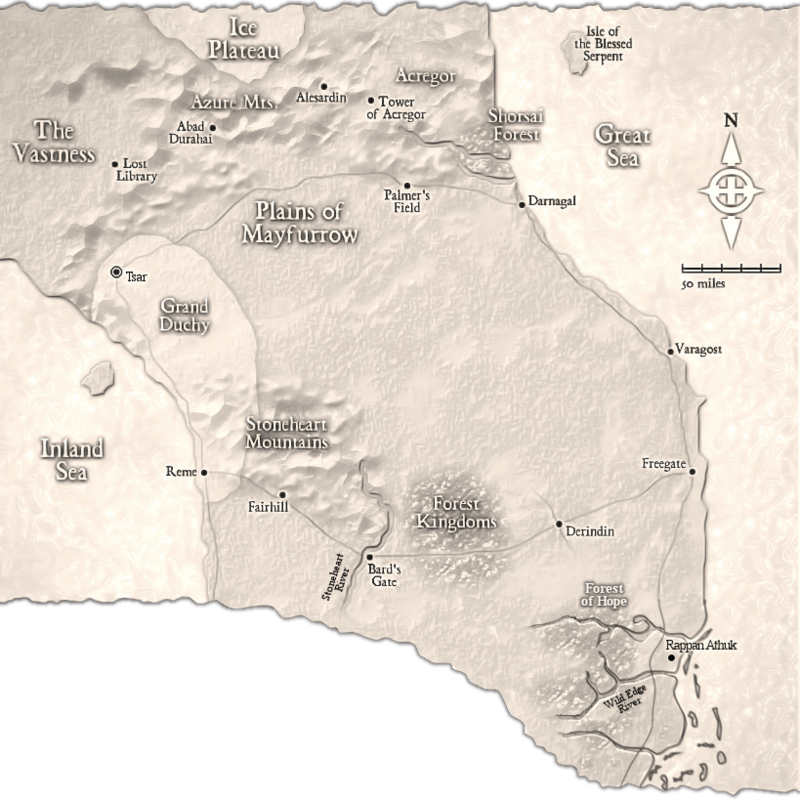 A relatively wealthy coastal realm, with rich farmland and excellent trade with the western kingdoms, via the city of Reme, and with the east coast along the Tradeway though Bard's Gate. The main seat of power in the Grand Duchy is the ancient city of Tsar. The ocean which forms the eastern boundary of the known world. Whether or not anything lays beyond it is entirely unknown, as nobody has yet succeeded in crossing it. Terrible storms and fierce sea creatures destroy ships which venture out of the coastal shallows. In the far north, beyond the Azure Mts, lays a large region of land at high elevation. It is always midwinter there, and the region is infested with cold-loving creatures, which occasionally (and mostly during the colder months) raid south, across the mountains, sometimes attacking as far south as Lost Library, Palmer's Field, and the Northern Tradeway. A large body of relatively shallow water to the west of the Grand Duchy. The Grand Duchy has trade routes which run from the port city of Reme to several locations beyond the Inland Sea. Located in the Great Sea, the Isle of the Blessed Serpent is home to a cult of humans who worship snakes. Sailors tend to regard it as an unlucky place, and few captains will take their ships there. The Library of Ellek was, a thousand years ago, the greatest repository of knowledge in the world. It was a sprawling complex of buildings, spread over several square miles, and was said to contain copies of every text ever written. It was entirely destroyed in a single night, razed by magic and dragons' breath. Today the village of Lost Library stands close to the ruins, and there are a number of monasteries nearby. These monastic orders, the largest being the Rekindled Light of Wisdom, search the ruins for scraps of ancient knowledge which might have escaped the destruction. A farming community on the Northern Tradeway, Palmer's field is heavily fortified due to raids by creatures from the Ice Plateau. The township provides a safe stopping place for traders, who will often wait here for caravans, and the associated safety in numbers. The stretch of road west of Palmer's Field, to the border of the Grand Duchy is probably the most notoriousous in the region. An expanse of open grassland, stretchung from the southern boundary of the Azure Mts to the Forest Kingdoms, and from the borders of the Grand Duchy to the Great sea. The plains are home to clans of nomadic horse breeders, and to large herds of grazing animals. The infamous Dungeon of Graves, constructed after the cult of Orcus was driven out of Tsar. The dungeon is a fortress, and has attracted many evil creatures to the area. A sea port on the Inland Sea, where ships from the exotic lands to the west bring cargoes of herbs, spices and fine silk. The last remaining kingdom of elves is located here, besieged by trolls, ogres, and other fell creatures out of Acregor. The High King of the elves, Merardig Farchti Nervanilu, is rumoured to be sick and dying. The elves believe that if he dies, then the kingdom will also fall. Several small colonies of dwarves have settled here within the last century or so, attracted by reports of mineral wealth, and by the option of trading with Bard's Gate and the Grand Duchy. The river plunges down steeply from the mountains, dropping over falls and rapids before finally slowing just north of Bard's Gate. A rolling area of moors and fens, populated by savage barbaric tribes and the dangerous creatures they hunt for food and skins. Once the palace of the necromancer who ruled the kingdom of Acregor, the Tower, and the surrounding fortifications and auxiliary buildings, now stand in ruins, reportedly haunted by all manner of undead. The Tower itself, raised by magical means, is now a broken stump, less than fifty feet high, burned and blackened by the forces which were used to slay Acregor. Tsar was, at one time, the primary centre of worship for Muir and Thyr in the whole known world, a vast city filled with temples and churches dedicated to the two gods. Then, about six hundred years ago, a secret temple of Orcus was established beneath the city. Over the next two centuries, corruption spread, until the city almost fell. Only an attack against the cult of Orcus saved the city. The demon god's temple was destroyed, and his worshippers driven from the city. Still, the damage had been done, and Tsar has not yet regained its former glory. Large portions of the city are still in ruins, and it is said that nobody who dies in Tsar ever rests peacefully. An independent port city on the coast of the Great Sea. Coastal shipping out of Varagost was once raided indiscriminately by pirates. That changed when the ruling houses of Varagost joined forces with those pirates, who are much more discriminating now, and only prey on ships which fly the colours of rival houses. While pirates serve the houses as troops at sea, within the city the favoured weapons are murder and treachery. A river flowing into the Great Sea near Rappan Athuk. The wide river mouth is rumoured to serve as a harbour for pirates, some of whom reportedly pay tribute to the temple of Orcus.